Mr. Mandela was most certainly not referring to a bathroom remodeling project, but his words ring true when it comes to surviving renovation. With everything completed, thanks to Chris providing finishing touches, Cam has settled into the new environment. Major improvements include easier access with a wider door and being able to drive right up under his sink. Having a shower instead of a bathtub is the biggest change in routine and one that has greatly decreased the time needed for nightly activities. Meadow Brook Elementary, where Cam attends school, celebrates the Chinese New Year every January as part of its Chinese immersion program teaching Chinese alongside English. 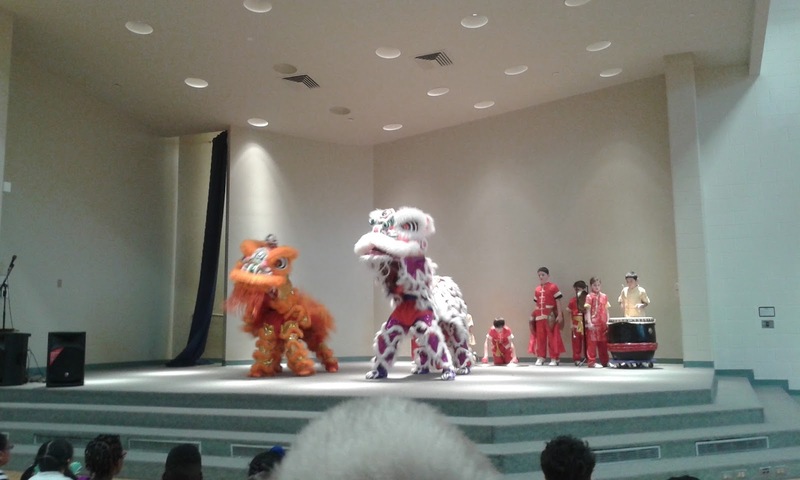 They had an assembly with a live dancing dragon and lion. 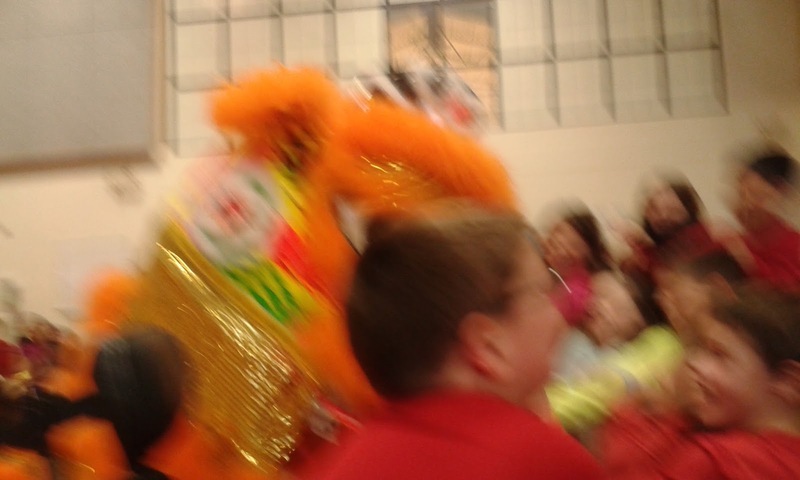 Cam got up close and personal with the lion during the Lion Dance. Ms. Kathy told us he laughed so hard. Also at school, Cam has been testing out some new equipment with his physical therapist. Tall standing- way to go! And, this week our scientific boy made butter at school. The experiment was to show how liquid becomes a solid. And the overall benefit - Cam brought some home for us all to taste. It was delicious! Back at home, buddy Emma was testing out her lego skills working on assembling a police car with Cam. They both agreed there were lots and lots of parts. Even with the tedious process, these two always find a way to have lots and lots of laughs in the process. With interrupted sleep becoming a nightly routine, Cam's pediatrician recommended his blood be tested for vitamin D deficiency and other common queries. Jane explained to Cam that they would go to a lab where some of his blood would be taken and tested to see if he had enough vitamins. Cam was a bit nervous about the routine and when his arm was being swabbed, he was explaining to the lab tech why he was there because his doctor had sent us to test his blood. When the needle pierced his vein, he didn't even seem to flinch. When Cam saw the blood flowing through the tube, he looked straight at the lab technician and said "Do I have enough vitamins?"